Kids’ drawings are the best, as astronaut Karen Nyberg proudly shows in her latest mini-quilt piece. The astronaut — who just spent six months in orbit during Expedition 36/37 — is also a prolific quilter and drew inspiration from her son, three-year-old Jack, in this quilt posted on Pinterest. The drawing shows how quickly Jack changed during her mission, she wrote. We’re guessing Nyberg is having an easier time quilting now that she isn’t working in microgravity anymore. The video below explains the challenges she had doing quilting in orbit and making sure that sharp pins didn’t just float away and cause problems on station. Nyberg is married to astronaut Doug Hurley (who piloted the final shuttle mission, among other things) and as the Houston Chronicle’s Eric Berger points out in November, the parents have lots of experience helping each other out with child care during training and missions. The big news around astronaut circles these days is the assignment of Takuya Onishi — from the Japanese Aerospace Exploration Agency — to Expedition 48/49 around June 2016. Onishi is from the class of 2009, and we’re guessing he’d be sure to poll his classmates on how their mission training is going. Well, another of the 2009 astronaut class — Luca Parmitano — just returned from six months in space. It was an eventful mission, with Parmitano facing down a scary water leak during a spacewalk, using the Canadarm to berth and let go of a cargo spacecraft, and then delighting the Internet with enthusiastic fist pumps just minutes after he landed. But he made it back safely, and looks more than ready to take on another mission in this picture. The cause of the leak is still under investigation, and NASA is holding off on more spacewalks with American suits until they figure out what happened. Parmitano’s mission also featured a unique collaboration with teenager Abby Harrison, who broadcasted her own question-and-answer sessions with him for the astronaut to reach a younger audience. That’s European Space Agency astronaut Frank De Winne talking about the emotions an astronaut or cosmonaut feels as they leave the International Space Station in a Soyuz spacecraft. The new ESA video, posted above, shows just how hard the astronauts and ground teams have to work to make sure the spacecraft gets to the right spot. From training, to calculating orbital trajectories, to making sure the landing site in Kazakhstan is free of debris, it’s easy to see how easily those landing teams get up to dozens and dozens of people. The undocking itself can be complex; depending on which port the Soyuz is attached to, the International Space Station itself may have to change its position to make sure the spacecraft is in the right orientation to head back to Earth. After navigating the hazards of space, sometimes the landing site can be treacherous as well. In Kazakhstan, the mounds of snow can build up in the area in the winter time; crews need to be prepared to retrieve the spacefarers in just about any weather condition. Luckily for the returning Expedition 36/37 crew yesterday, conditions were clear — albeit pretty cold, at 26 degrees Fahrenheit (-3 degrees Celsius). Check out Universe Today‘s full coverage of the successful crew and Olympic torch landing here. Can The International Space Station Fit Bigger Astronaut Crews? Things are a little more crowded than usual in the International Space Station. For a few days, nine astronauts and cosmonauts are floating in the cramped quarters of the orbiting complex. Typical crew sizes range between three and six. How did the astronauts find room to work and sleep? “One of the things we had to do was make space for them,” said European Space Agency astronaut Luca Parmitano in a rare press conference today (Nov. 8) from orbit, which included participation from Universe Today. He then explained a procedure where the astronauts swapped a Soyuz crew spacecraft from one Russian docking port to another a few days before Expedition 38/39’s crew arrived on board on Thursday. This cleared the way for three more people to arrive. “We [also] had to adjust for emergency procedures. All of our procedures are trained and worked for a group of six. We had to work on a way to respond if something happened.” As for sleeping, it was decided the six people already on board, “as seniority, would stay in the crew quarters.” The newer astronauts have temporary sleeping arrangements in other modules until the ranks thin out a bit on Sunday. So this works for a short while, but what about the long-term? Could the station handle having nine people there for weeks at a time, rather than six, and would there be enough science work to go around? Parmitano, Nyberg and Russian cosmonaut Fyodor Yurchikhin plan to return to Earth Sunday, but a busy weekend lies ahead. On Saturday, Roscosmos (Russian Federal Space Agency) flight engineers Oleg Kotov and Sergey Ryazanskiy of the Russian Federal Space Agency will start a spacewalk around 9:30 a.m. EST (2:30 p.m. UTC) if all goes to plan. As part of the Olympic torch relay ahead of the Sochi games in 2014, they will briefly bring the Olympic torch outside with them, unlit, before doing some outside maintenance. 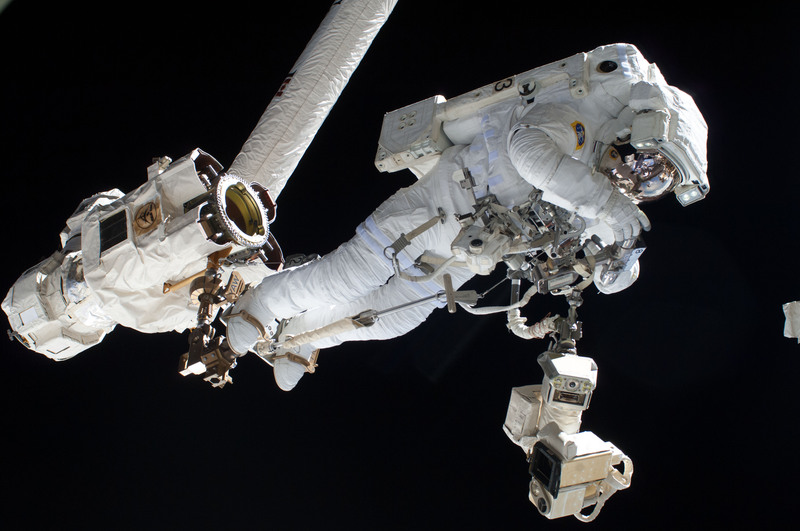 “After the photo opportunity, Kotov and Ryazanskiy will prepare a pointing platform on the hull of the station’s Zvezda service module for the installation of a high resolution camera system in December, relocate … a foot restraint for use on future spacewalks and deactivate an experiment package,” NASA stated in a Thursday press release. Several journalists were unable to ask questions during the NASA portion of the press conference, which included participation from countries covered by NASA, the European Space Agency, the Japanese Aerospace Exploration Agency and Roscosmos (the Russian Federal Space Agency). “We had a failure in a crucial component in the phone bridge,” NASA spokesman Kelly Humphries told Universe Today following the media event. They don’t know what component failed, but most of the journalists were unable to hear the moderator or the astronauts. NASA will do a thorough investigation before holding another event like this to make sure it works for everyone. From guitar playing to quilting, it’s clear that the astronauts aboard the International Space Station have excellence in other interests besides their core jobs. NASA astronaut Karen Nyberg, shortly finishing up her nearly half-year mission in space as part of Expedition 35/36, is an accomplished crafter. She’s found time to make a dinosaur from spare scraps and several headbands to keep her long hair from flying in her face. And now she wants you to join with her work. Despite her skill in crafting, however, Nyberg says working in microgravity is quite the challenge. She keeps all her supplies in a ziploc so they don’t go flying in all directions when she’s not using them. A pile felt board keeps everything secured while she is working on a piece. But measuring and cutting when you can’t lay something down means working takes a long, long time. That’s what makes this single nine-inch-by-nine-inch quilting block below so precious. Nyberg says her work is “far from being a masterpiece”, but is inviting other quilters to share the metaphorical stage with her creation. Quilters anywhere in the world can make star pieces of their own and send it to the International Quilting Festival organizers for display in fall 2014. If all goes well, Nyberg expects to make an appearance to view the creation herself. By the way, the full video of Nyberg explaining her sewing challenges makes you sympathize with how hard microgravity can be. Although the backflip she does at the end likely makes up for at least some of it, right? 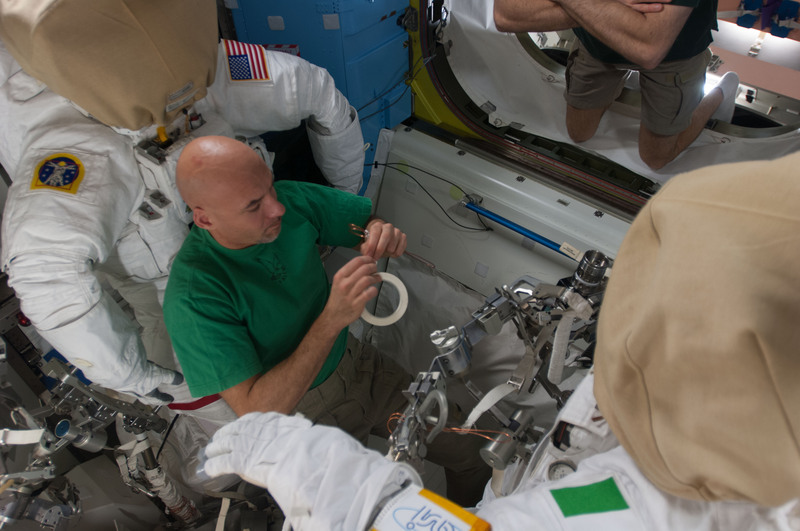 Here’s the latest attempt to hunt down the water leak that aborted Luca Parmitano’s spacewalk in July: two astronauts aboard the International Space Station removed and replaced a fan pump and water separator inside the spacesuit earlier this week. All spacewalks with NASA suits are on hold while the agency investigates the leak, and they have been trying mightily. In late July, then on-station NASA astronaut Chris Cassidy demonstrated how the pool of water spread within the helmet (as you can see in these YouTube videos). This week, on-orbit NASA astronauts Mike Hopkins and Karen Nyberg delved further. While the astronauts are trained before their missions on some suit repairs, this particular type was not something that was covered before they left Earth. After Mission Control walked them through what to do, the astronauts proceeded cautiously as they did the work, NASA said. “Our engineering teams have identified several different components of the suit, designing a big fault tree, and this is just one of the components that we think could have contributed to the leak in the suit,” said Alex Kanelakos, an extra-vehicular activity flight controller and astronaut instructor, in a new YouTube video. As Kanelakos explained, a motor inside the suit drives the fan pump and water separator. The fan circulates oxygen, and the pump pumps the coolant fluid. The water separator, meanwhile, takes out moisture (water) from the ventilation loop and gas that could be trapped inside the water coolant loop. The dried-out air is then returned to the crew member for breathing, and the cycle continues. In September, Cassidy told Universe Today that the spacesuit is expected to come back to Earth during a future SpaceX Dragon cargo flight. That type of spacecraft is (unusually among space trucks) designed to survive re-entry in the atmosphere, allowing engineers on the ground to examine the spacesuit after it comes back. Cassidy added that the situation was serious, and he supported NASA’s decision to end the spacewalk (which he was also participating in.) He didn’t think, however, that Parmitano was in immediate danger of drowning. 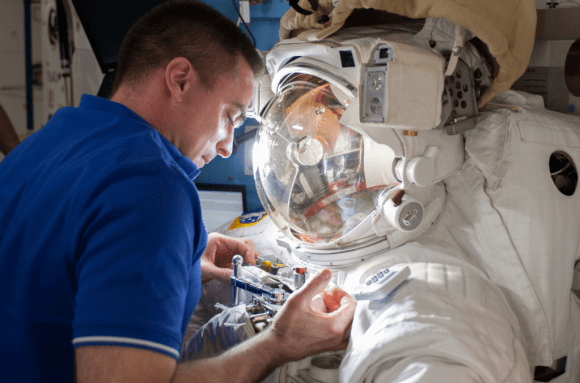 For his part, Parmitano wrote a blog post on the European Space Agency website after his spacewalk, saying that space is an “inhospitable” arena. “The only idea I can think of is to open the safety valve by my left ear: if I create controlled depressurisation, I should manage to let out some of the water, at least until it freezes through sublimation, which would stop the flow. But making a ‘hole’ in my spacesuit really would be a last resort,” he wrote. That fix, however, was not implemented as Parmitano and Cassidy made their way back to the station in time for their crewmates to repressurize the hatch and bring their Italian crewmate safely inside. Besides investigating the spacesuit, NASA has an ongoing parallel investigation to look at “lessons learned” from the mishap and ways of implementing procedures to stop such an incident from happening again. Isn’t that aurora facing the wrong way? Not if you’re in space! NASA astronaut Mike Hopkins tweeted this picture from his perch on the International Space Station a few days ago. He sounds jazzed to be on his first mission: “Can’t believe this is really me from the Cupola and that I’ve been in space for almost 3 weeks now!” he wrote on Twitter Oct. 15. We’d be pretty excited, too! Luca Parmitano (from the European Space Agency) is also on his first trip into space. In between their many experiments, the rookies must relish the opportunity to take pictures of the view. Which image of theirs below is your favorite? Did we miss any notable shots? Let us know in the comments. And of course, they’re grinning like crazy up there. Meet Abigail Harrison. This teenager’s enthusiasm about space so impressed Luca Parmitano — who just happens to be a European Space Agency astronaut on the space station right now — that the two have a social media collaboration going. Abby collects questions from readers of her blog (AstronautAbby.com) and sends them up to the station for Parmitano to read and respond to. Parmitano’s first mission in space, which he calls Volare (“Fly”), has been a busy one. He’s driven a rover, practiced grappling techniques for the Cygnus spacecraft — which was delayed in its docking to Tuesday (now Saturday) — and experienced two spacewalks (one went to plan, and the other was cut short due to a spacesuit leak). Meanwhile, Abby had a space-y summer of her own. She fundraised thousands of dollars to see Parmitano’s launch in May. Then she went to Space Camp and toured several NASA and international agency centers. We caught up with Abby to find out how things are going — and if this brings her any closer to her dream of going to space herself. Below is a slightly edited e-mail conversation about her adventures. Universe Today: How’s it going with the partnership? Abigail Harrison: Working with Luca has been a lot of fun! I have really enjoyed being able to e-mail with him on station and especially the opportunity I had to talk to him while visiting Marshall Space Flight Center in Huntsville, AL at the end of July. The AstronautAbby community has been very active sharing images of the Space Station flying by for my #CatchLuca weekly blog post, and the #AskLuca questions submitted by my community have been great. It’s fun to hear how Luca answers these questions each week. UT: What are the best things that you have been doing specifically to spread the message of Volare? AH: I think my #CatchLuca blog series has been a real hit! So many people from around the world have taken photos of the ISS passing overhead and decided to submit them and share with the world. It’s been great! I think this helps to spread the message as it is people on Earth getting excited about the space station and sharing their own pictures. The more sharing that happens, the more aware people get about the mission and the more they learn. The #AskLuca series has also been very successful. It’s true, anyone can jump on social media and ask a question of Luca or any astronaut and they most likely will answer it, but this series has allowed people who may not be socially savvy to ask questions, as well as people to ask longer questions. The fact that all the answers are published on my blog is also great as people can read it in a published article versus on a social media update. UT: Tell us more about these NASA tours you’ve been doing lately. What is your goal in doing them? AH: I have been fortunate to be in the right places at the right time. This summer I was in Houston for a gymnastics camp, and therefore I was able to tour the Johnson Space Center – but not just tour the center, I got to see the Neutral Buoyancy Lab and compare it to the Russian counterpart that I saw in May during my visit to Star City [astronaut training complex in Russia] when attending Luca’s launch. I also was able to go on the floor of Mission Control and see a specialized robotics lab, along with a lot of other cool things. After Houston, I headed to Huntsville for Space Camp. While in Huntsville I was able to tour the Marshall Space Flight Center and specifically see some of the work NASA is doing along with ATK to build the Space Launch System, which is the rocket system that will take me to Mars someday (similar but much bigger than the Saturn V rockets that took Apollo to the moon). Finally, I visited Lockheed Martin’s facilities in Colorado to see the production of the Orion, which is the spacecraft currently being developed to go to Mars, the moon and asteroids. These visits have tremendous value as I have been able to share pictures, write about the visits and talk about what I have seen with people everywhere. The goal is to learn about what is being done right now to realize the future American missions to Mars, the moon and asteroids and continue human space flight. The more I learn and understand about our current efforts to realize the future of human space exploration, the easier it is for me to talk about the future and educate the general public. Part of my mission is to help spread the word to people around the world about the future of human space flight and get the public excited for what we will do next. UT: I’m sure you’ve been talking to Luca regularly. What do you talk about? AH: We e-mail and tweet quite a bit. We have only talked once. To be honest, I follow his mission very closely through his online updates and ESA and NASA updates for my role as his Earth Liaison, and therefore I am up to date on what he is doing, probably more up to date than most people. UT: Do you feel any closer to being in space as a result of this partnership? AH: Yes, I do. How could I not? I would guess that anyone who personally knows an astronaut living on the ISS would feel closer to being in space. The personal connection means you are paying close attention to everything the astronaut is doing, and following the mission very closely. The fact that I am sharing so much of what Luca is doing as part of my role as his Earth Liaison also helps me feel closer to being in space, because I am sharing with so many people and they in turn offer me support everyday towards my goals. I watch Luca and can imagine the day when it’s my turn to go into space. It’s been an incredible experience to get to be part of his mission.